U.N. Secretary-General Antonio Guterres appealed for large-scale humanitarian aid to Gaza on Wednesday in his first visit to the isolated territory as U.N. chief and ordered the immediate release of $4 million from the world body's emergency relief fund. "I am deeply moved to be in Gaza today, unfortunately to witness one of the most dramatic humanitarian crises that I've seen in many years working as a humanitarian in the United Nations," Guterres said. He later said it was "important to open the closures," in a reference to Israel's decade-long blockade of Gaza and its border with Egypt that has remained largely closed in recent years. 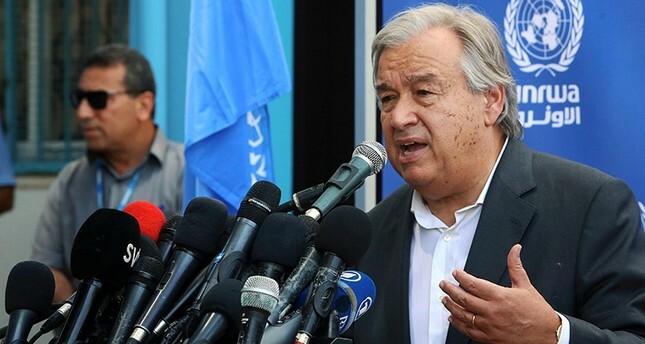 Guterres made the comments at a school run by the UN agency for Palestinian refugees, UNRWA, in the northern Gaza Strip. At least 70 percent of Gazans are dependent upon international aid. UNRWA plays a major role in the strip, with the same percentage of the population classified as refugees. Guterres also called for unity among the Palestinian groups – Hamas, which rules Gaza, and Fatah, which rules parts of the occupied West Bank. "The division only undermines the cause of the Palestinian people," he said, adding that he had a dream to "come back to Gaza one day and to see Gaza as part of a Palestine state in peace and prosperity." Guterres is on his first visit to the region since taking office at the beginning of the year. He has met with Israeli and Palestinian leaders aiming to encourage the resumption of peace talks. But he did not meet with Hamas officials in Gaza, who issued a demand he work to lift the Israeli-Egyptian blockade of the strip and save it from a humanitarian crisis. Hamas also demanded he approve relief and development programs and pressure Israel about the Palestinian prisoners it holds. Prior to arriving in Gaza, he took a helicopter tour of the Israel-Gaza border with Israeli officials, visited a tunnel Hamas dug into Israel to carry out attacks and met local residents living along the volatile front. Hamas, a resistance movement that seeks an end to Israeli occupation, has ruled Gaza since seizing control of the coastal area in 2007. Repeated attempts for reconciliation between Hamas and Fatah have failed. Hamas has since fought with Israel, firing thousands of rockets into its territory and digging a network of elaborate offensive tunnels. It has largely observed a truce with Israel since the last battle, in 2014, though more radical groups in the territory have carried out occasional attacks. Egypt and Israel imposed a blockade on Gaza after the Hamas takeover that has crippled the local economy. In recent years, Egypt has also cracked down on the once-vibrant tunnel trade along the border. Israel began construction of an underground anti-tunnel barrier along the border last year.